The paralegal and legal assistant profession in the state of Wyoming is currently modest, but like the rest of the nation, it is experiencing a period of healthy growth. The Bureau of Labor Statistics states that there are only about 450 paralegals currently located in Wyoming, with the majority of professionals based out of Casper, Jackson and other cities and urban areas. Overall, paralegal jobs in the US are estimated to grow within the next decade, leading to 70,000 new jobs. This strong upward trend for paralegals is largely due to the legal industry’s new tendency to hiring paralegals, rather than expensive lawyers, for more legal work. 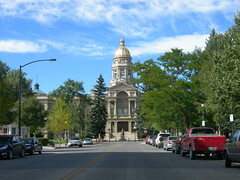 In the Wyoming Rule of Professional Conduct 5.3, the term “paralegal” is not defined, but instead, all legal assistants who are not licensed attorneys are considered “paraprofessionals.” State law requires that only licensed attorneys may practice law, and their legal assistants cannot provide any legal services, including legal advice, unless under the supervision of a lawyer, who in turn is responsible for their professional actions. To date, the state of Wyoming doesn’t mandate any certification or registration for working paralegals. To begin their career, aspiring legal assistants located in Wyoming have a couple options: they may either enroll in a Paralegal Studies program at a school, or may earn the title directly through training in the workforce. When it comes to getting hired, however, paralegals with formal educations and degrees are often preferred by employers. If possible, it’s best to earn a certificate or degree in paralegal studies for the largest array of employment opportunities. For those working as paralegals without a certificate or degree, it may be worthwhile to speak to your employer about supporting higher education — some employers may be willing to provide financial assistance towards a formal degree or certificate. To become certified, paralegals must take and pass a national approved certification exam. Becoming a member of professional paralegal organization, such as the local Legal Assistants of Wyoming, which is an affiliate of the National Association of Legal Assistants (NALA). Whether national or local, professional organizations are worth joining. For a small membership fee, these associations provide valuable network ties, access to exclusive job listing, and community outreach opportunities. Being a member of a recognized professional organization also looks great on a resume. The current average annual salary for legal assistants in Wyoming is about $44,000 . The majority of paralegals in this state are provided employment by private law firms, although some paralegals are also hired by corporations and government branches as well. There is no national authority to monitor or regulate the paralegal certification process in the US. Instead, the American Bar Association (ABA) provides the oversight of law studies education and provides endorsements to college programs that meet its strict education criteria. Paralegal programs are not required to seek ABA endorsement, but an approval this influential organization shows a program’s credibility and quality. Many programs, therefore, seek their approval for all law studies programs. Because of this, many law firms and other paralegal employers require applicants to receive their education from an ABA-endorsed program. While the ABA focuses on a law program’s quality, the US Department of Education seeks to ensure the legitimacy of a college or university as a whole. This accreditation status is increasingly important to both students who seek legitimate and ethical education, and employers who hire them. Many employers do not have any requirements for paralegal education, but earning a certificate or degree from a school program that has both a Department of Education accreditation and an ABA endorsement will go a long way in providing the best paralegal training possible, and the most employment opportunities after graduation. Casper College – Casper College offers both an Associate degree and a Post-baccalaureate Certificate through its Paralegal Studies program. In addition, the Paralegal Associate degree transfers easily, allowing students to pursue their Bachelor’s in a related field. Internships are encouraged, but not required to graduate from the program. Laramie County Community College – Located in Laramie County, with another campus in Cheyenne, this college also offers students an Associate of Applied Science degree as well as a Post-baccalaureate Certificate through its Paralegal program. The Associate degree in Paralegal Studies takes a minimum of 64 credit hours to complete.